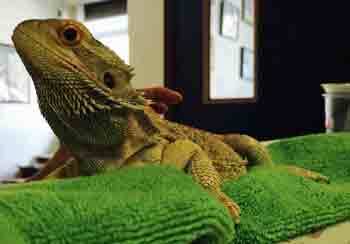 Sierra Veterinary Hospital treats pocket pets, reptiles and birds as well as dogs and cats. We feel especially qualified in this area because our employees have rabbits, guinea pigs, ferrets, snakes, lizards and birds in their own homes. We understand the “one-of-a-kind” care necessary to treat your pet and look forward to providing that service. Many exotics have special nutritional needs, as well as specific housing requirements. Daily care is essential in keeping exotic pets healthy, happy and preventing disease. Their health can suffer if not given proper care. Sierra Vet Hospital will work with you to create a wellness plan, including regular examinations to meet your pet’s needs. Unfortunately, there is not a vet who specializes solely in exotics in South Lake Tahoe. The veterinarians at Sierra Animal Hospital do see exotics, but they are not our primary speciality. Dr. Monroe used to be a zoo veterinarian so he is familar with caring for many different species of animals and likes seeing exotics. We are willing to help exotic animals and their owners to the best of our abilities. If we think a certain animal needs to be seen by an exotic specialist we can arrange to have you travel to see one. Please call 530.542.1952 to schedule your appointment today.